Washington D.C. might be loathed from every corner of the nation, yet these are fun and busy days at this nexus of big politics, big money, big media, and big vanity. There are no Democrats and Republicans anymore in the nation's capital, just millionaires. Through the eyes of Leibovich we discover how the funeral for a beloved newsman becomes the social event of the year; how political reporters are fetishized for their ability to get their names into the predawn e-mail sent out by the city's most powerful and puzzled-over journalist; how a disgraced Hill aide can overcome ignominy and maybe emerge with a more potent "brand" than many elected members of Congress. And how an administration bent on "changing Washington" can be sucked into the ways of This Town with the same ease with which Tea Party insurgents can, once elected, settle into it like a warm bath. 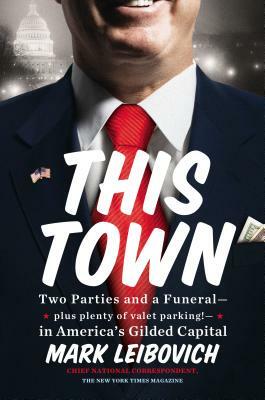 Outrageous, fascinating, and very necessary, This Town is a must-read whether you're inside the highway which encircles DC - or just trying to get there. Mark Leibovich is The New York Times Magazine chief national correspondent, based in Washington, D.C. In 2011, he received a National Magazine Award for his story on Politico's Mike Allen and the changing media culture of Washington. Prior to coming to the Times Magazine, Leibovich was a national political reporter in the Times' DC bureau. He has also worked at The Washington Post, The San Jose Mercury News and The Boston Phoenix, and is the author of The New Imperialists, a collection of profiles on technology pioneers. Leibovich lives with his family in Washington.